Yesterday as I was in the car flipping through radio stations, I landed on a news report about the fire at Norte Dame Cathedral in Paris. Although I have never seen the Cathedral in person and had been coveting my sister and brother-in-law's trip to Paris last week, my heart ached as I listened to the news report. This Parisian iconic site is known for its majesty, its breathtaking architecture, and its fascinating connection to some of the most historic events in history. Yet, first, it is a dwelling of deep devotion and veneration to our Lord and Savior, Jesus Christ. As I listened to an interview with Bishop Robert Barron, I imagined the countless people that had gathered in that sacred space for prayers and petitions, songs and sacrament, as well as pronouncements and proclamations. 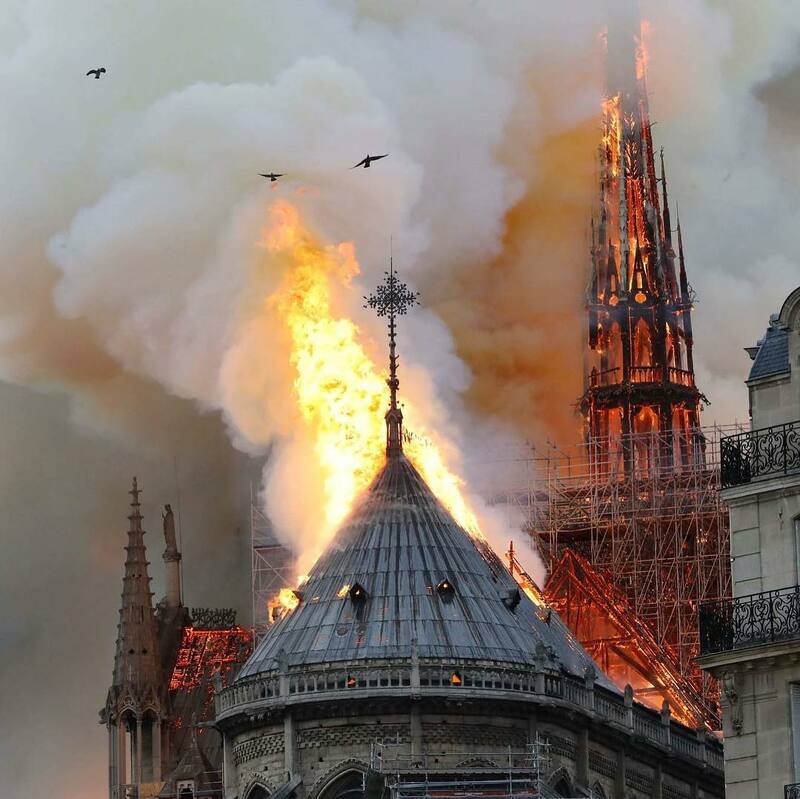 As Bishop Barron spoke about the Norte Dame fire, I was moved to hear him share his story, his personal connection to the cathedral as he described the beautiful stained glass windows and the sermons he heard preached there.Yet, what moved me to tears was his succinct powerful summation of the loss... "A building that survived 800 years of revolution, war and everything else, to think that it might be in danger of being destroyed is just overwhelming to me." Overwhelming. What a perfect word for this event as well as for Holy Week! How overwhelming it must have been for those first disciples to hear Jesus speak of his impending death. How overwhelming it must have been to encounter the soldiers in the Garden of Gethsemane as they encroached on Jesus' time of prayer to arrest him. How overwhelming it must have been to be pushed along with the crowds, which gathered beneath the balcony of Pilate's palace demanding not for the release of Jesus, but Barabbas instead. How overwhelming it must have been to realize that Jesus, carrying his own cross, would die the death of a common criminal. How overwhelming it must have been to be present at the foot of the cross, unable to do or say anything to relieve Jesus' pain and suffering. How overwhelming it must have been for those who heard the dragging of the stone and the echo of finality when the tomb was sealed. In all of those moments and those to follow, words must have failed them as they watched the last three years of their lives and a hope for a different future all seemingly go up in flames. Yet, we know death and destruction did not have the final word. May we still believe this to be true. As the fire at Norte Dame continues to smolder, may God protect those who are able to rush away from the fire and those who will rush towards it in the hours and days to come in order to preserve what they can. May the message and hope of the resurrection lift the hearts and spirits of all those who are heart sick by the reality of this fire. May we who feel far from this tragedy, but who have our own overwhelming moments of destruction and despair, remember such moments never have the final word. This is the truth, beauty, and miracle of what we celebrate in the coming week and beyond.